Palm Sunday Masses at Holy Rosary Church | Ciao Washington! 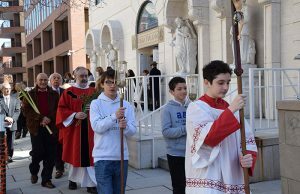 Palm Sunday (March 25) will be commemorated at Holy Rosary Church with the blessing and distribution of palms at Casa Italiana followed by a procession to the Church before each Mass. The Masses are at 9:00 am in English; 10:30 am in Italian; and 12 noon in English. On Holy Thursday (March 29), a bi-lingual Mass will be celebrated at Holy Rosary Church at 7:00 pm with a procession and the washing of the feet.